There are many applications where knowing whether there is flow or no-flow conditions of a fluid in a pipe is important. A thermal flow switch is an option to consider to provide such positive indication of flow or no-flow conditions. 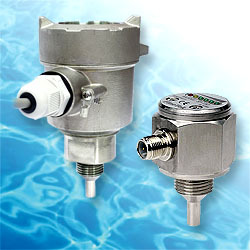 Detecting flow conditions also can be accomplished using a electromechanical paddle type flow switch. However, a thermal flow switch operates without any moving parts and therefore is more reliable. No moving parts or wear and tear. Multiple types of output signals are available. Application and use of the thermal flow switch can be found in water power plants, steel production, marine use, food processing, pharmaceutical manufacturing, semiconductor manufacturing and many industries where flow sensing in pipes is required. For a further look at a thermal flow switch product line you can visit our SP series product page or download the SP series flow switch sales catalog. For more information on the SP series thermal dispersion flow switch product line you can contact us at 815-632-3132.